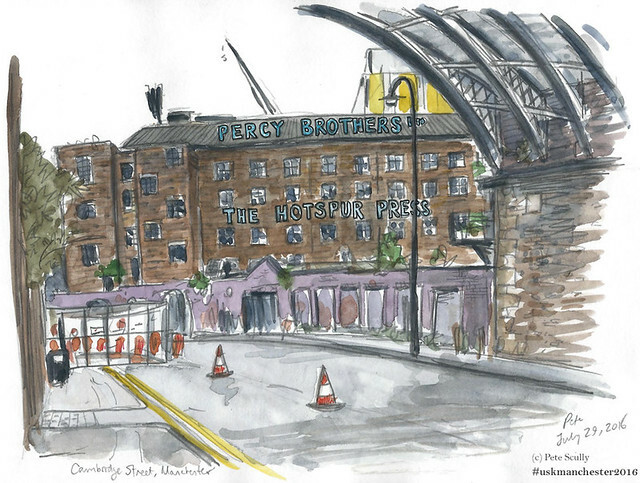 And now for a post showing many of the other buildings and views I sketched in Manchester during the 7th Urban Sketching Symposium. Usually sketched between workshops or activities (or while skipping activities because sketch-sketch-sketch). I would love to explore Manchester – the north of England in general – in more depth and at unbound pace, but here are some street scenes and buildings that I managed to fit in. Above, the Grosvenor Picture Palace, a building I feel sure was sketched a few hundred times that week, being right opposite the Manchester School of Art on Oxford Road.Buses whizzed by as they do, and while it was damp it managed not to rain while I sketched, stood on the corner of All-Saints Park. 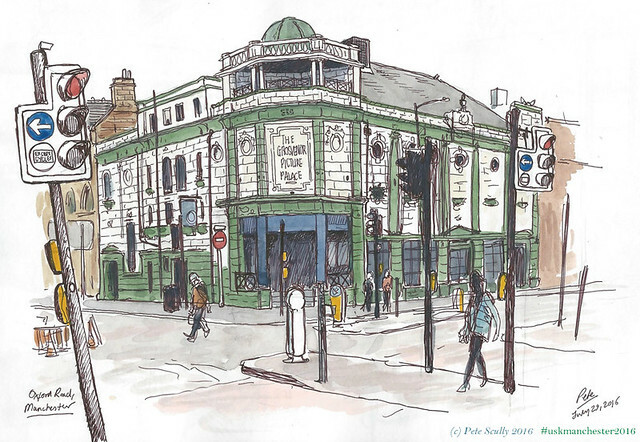 This pub, the Lass O’Gowrie, was on the way back to my apartment and I just had to sketch it. however the time I chose to sketch was probably the wrong one – I got the time of the final big group photo wrong (6pm), thinking it was 6:30pm (doh! ), and so I missed it because I was sketching this. Second time I have missed the final group photo at a Symposium! It’s becoming my Thing. 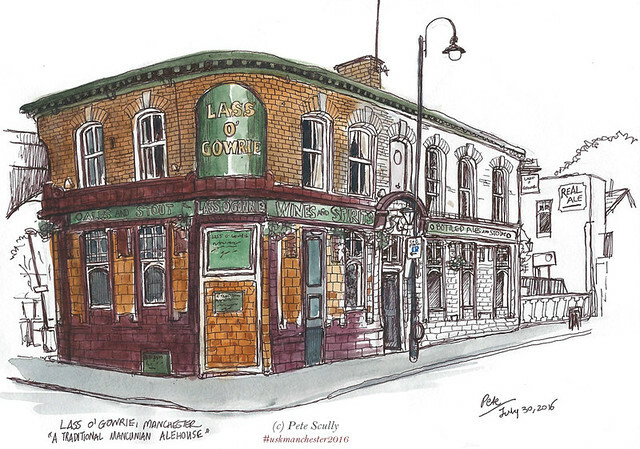 Still I am not too downhearted about that, as I probably would not have had the chance to sketch this pub, and I’m happy I did, a traditional looking Mancunian ale-house, next to a small canal-way. I went for a half-coloured-in look because I only half-coloured it in before dashing back to All-Saints Park for the final group photo, like an idiot. At least I got into the American group photo (I am after 11 years in California an honorary American now after all (at least where urban sketching is concerned! ), a nice group to be in. 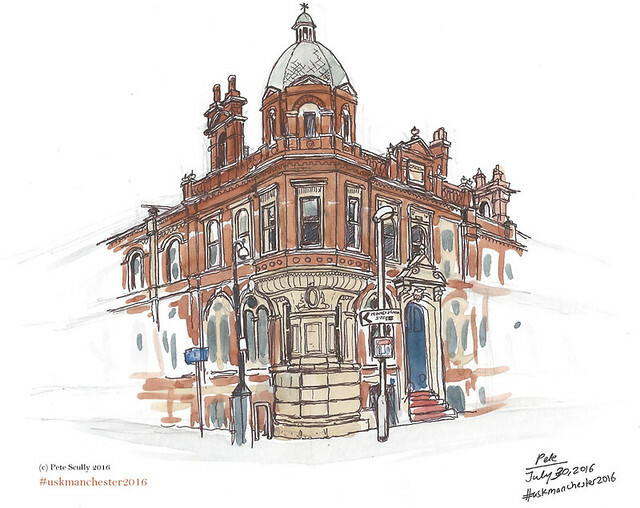 This was sketched earlier in the afternoon, right opposite All-Saints Park. It only took twenty minutes or so, Johnny Roadhouse Music, but that was because I considered doing a big panorama (decided against it!). You can see my ‘working-out’ on the sides there. After sketching Johnny Roadhouse Music I walked back over to the School, on my way to one of the presentations I’d signed up for, however I got side-tracked talking to Paul Heaston and Marc Taro, who were sketching the Ormond Building, another that was surely sketched several hundred times (and then some) over those few days. Sketchers were starting to dot around the area as part of the Final Sketchwalk (all waiting for the Final Group Photo; yeah, that was a good idea). 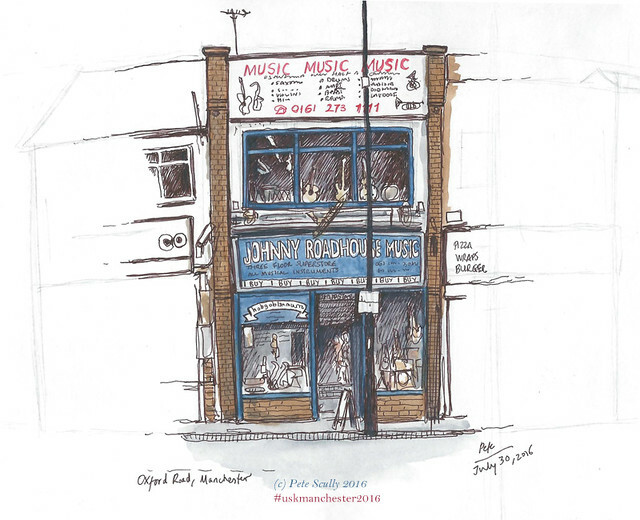 What with chatting to fellow sketchers and working on the perspective this building took about an hour and a half, compared to the quicker music shop sketched before it. I always worry I’m not going to come back from somewhere with enough sketches to ‘justify’ the long journey out there, and I still had a few things left on my list. Still I enjoyed the experience sketching this building, and it was nice to talk to people, and learn from how they approached it. The Hotspur Press! I had to sketch it. I drew it on the way back from Veronica Lawlor’s workshop, drawing quickly in pencil beneath a railway arch to shelter from the rain, but I had to add colour afterwards as I needed to get back to the School; I had been told I was to be signing copies of my book (though I got there, and they didn’t even have any copies of it). The rain-soaked old brick and industry, that’s the North isn’t it. Hotspur by the way would be a reference to the Percy’s; Harry Hotspur was a medieval knight and member of the Percy family, Henry Percy, son of the Earl of Northumberland. This is why Tottenham Hotspur are so named, too – they were originally Hotspur FC, and the Percy family owned land in the Tottenham area (think Northumberland Park). For the Silent Auction many of us were asked to donate a sketch, and so because my other Thing (apart from Missing the Final Group Photo like a late idiot) is of course Fire Hydrants. 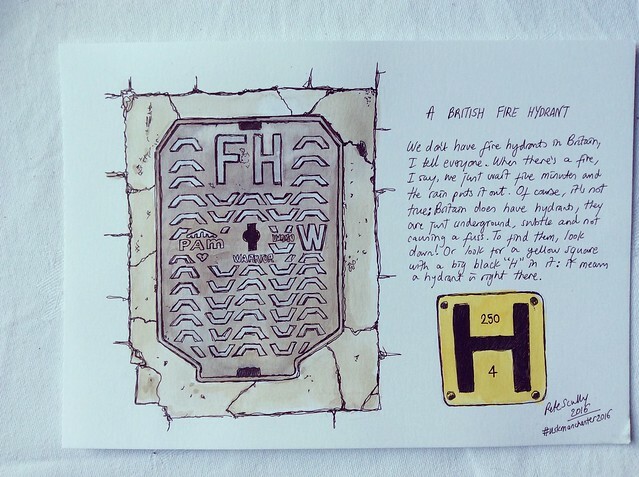 Now in England they are underground, so I drew one of those, with an explanation as to how to find British hydrants. Here it is! And it sold as well!